3 Masters w/Queen, 1 w/3 Bunk Sets, 1 w/ Queen. Sheets and Towels Provided, Beds Made. JUST SECONDS AWAY FROM H2OBX! 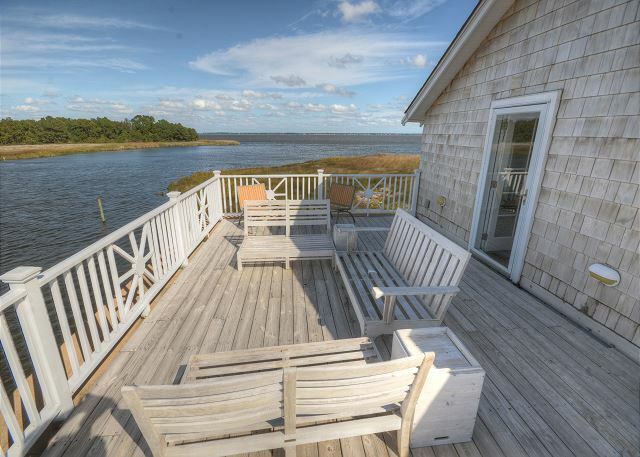 Providing unparalleled water views from every room in the house, Southern Comfort is Soundfront on the mainland in Currituck County, just minutes away from the Outer Banks! 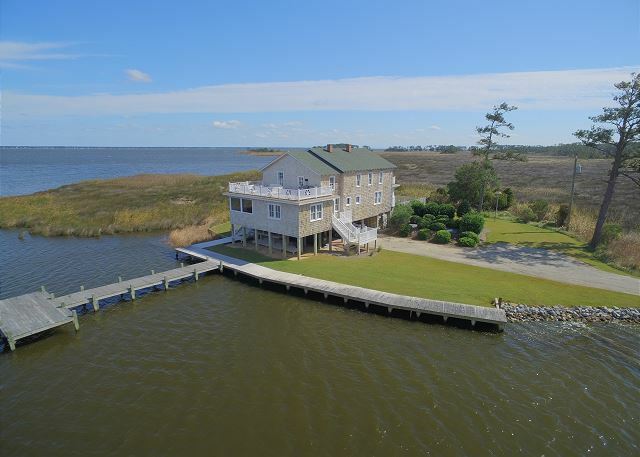 With more than 200 feet of frontage on the sound, the vistas from this home have been called "the best views in Currituck County"! Located on its own private peninsula, Southern Comfort feels like your very own family compound or bed and breakfast. Easy access to all the Outer Banks has to offer via the Wright Memorial Bridge is just minutes away. The home provides an on site boat launch area and brand new large, private platform dock for your boat and other water toys! . Enjoy the harbor and tributaries throughout the sound where wildlife and nature abound! Southern Comfort was originally built in the 1920's and was known as the G.C. Sawyer Hunting and Fishing Lodge. It has been lovingly restored into a 5 bedroom, 4 bath retreat that could be featured in Country Living! 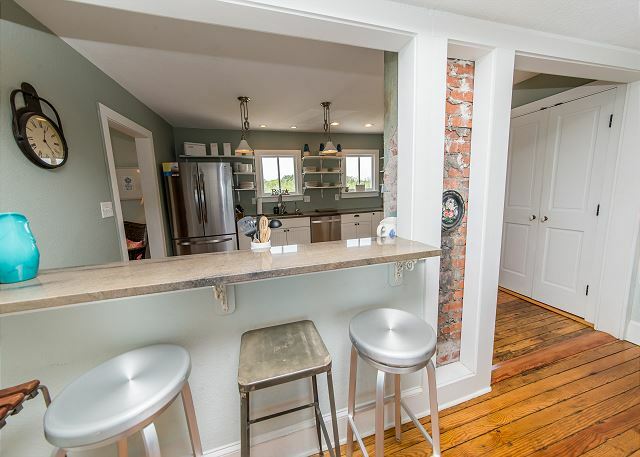 Original details like hardwood floors and beaded board walls are still intact, yet blend seamlessly with the updated kitchen and bathroom areas. If you are a history buff, this is the place for you! In addition, there are 2 family living areas as well as a dining room, and an unbelievable screened in porch! To top it off, outdoor spaces are plentiful with 5 decks including a private one off of your master suite! Your private swimming pool is ready for a brisk swim . . . or perhaps you would prefer the hot tub to soak your tired muscles after your day of play and fun. Oh, and don't worry about having to come across the bridge to get your house keys! you will beat the traffic by being provided with an access code prior to arrival for your 4pm entry into Southern Comfort. Enjoy golf? You are minutes away from several championship golf courses - The Pointe, The Carolina Club, Kilmarlic and Goose Creek. What about hunting and fishing? 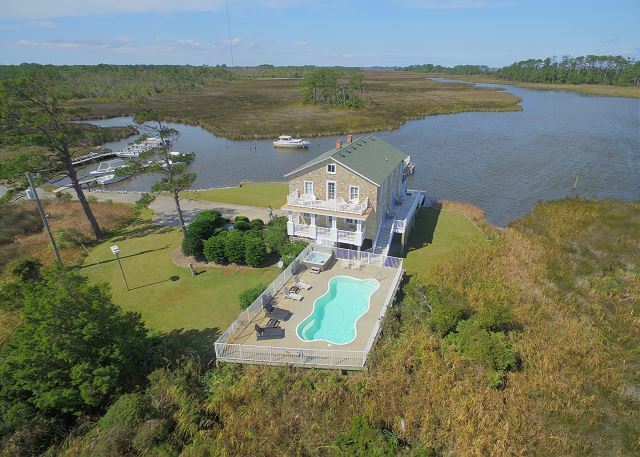 The Currituck mainland has a long and storied history of hunting and fishing in which this home was featured prominently! NC state licenses are required. Enjoy the beach? No problem! With the bridge a short ride away, you are convenient to the beach, awared winning restaurants, shopping and more!! Southern Comfort has it all - the peacefulness and tranquility of your own private retreat yet still close to everything! You will never want to leave! 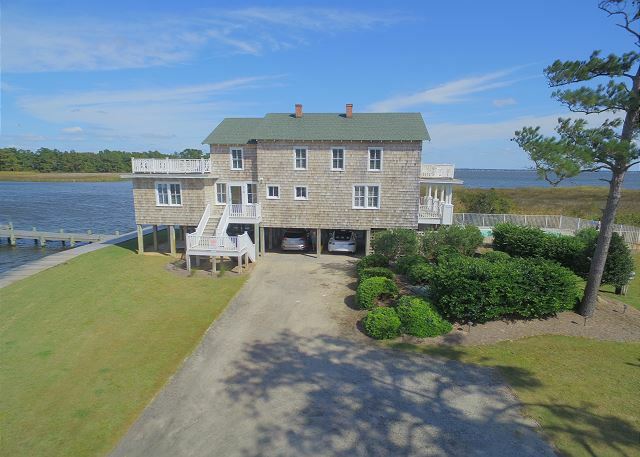 This home is located on the Mainland in Currituck County, approximately 5 miles from the Wright Memorial Bridge to the Outer Banks. Other amenities include private platform dock, unparalleled water views, views from every room, boat launch area, extensive decking, kayak, 2 stand up paddleboards, 2 living rooms, 5 CATVs, DVD, fully equipped kitchen, original hardwood floors, bead board walls, historic landmark, books, board games, DVD movie library. Located on Currituck Mainland. Ground Level: Pool, Dock for Boats, Fishing & Crabbing. First Level: Living Room w/Flat Screen TV, Kitchen, Kitchen Island Seats 2, Nook Seats 4, Dining Seats 8, Full Bath, Bedroom w/3 Bunk Sets, TV, Decks. Upper Level: 3 Queen Masters, Bedroom w/2 Twins. Please note: Jet Skis located on the property are for OWNERS USE ONLY. It is a great location. We enjoyed the house. The tap water was smelly and turned the nice white towels and shower stalls orange. There was also ants in the kitchen and dining area. We realize this can be a beach thing so it did not ruin our trip. The only other issue we had was not knowing the information for the locks to get the kayaks and paddle boards. There was no info for the locks or when to put the garbage out and the garbage and recycling cans where full when we arrived. other than those 3 major issues we really enjoyed the quality and location of this home. Thank you for taking the time to give us feedback on your stay. The unique qualities of the Outer Banks unfortunately, also share some drawbacks. The quality of the water may vary and will probably not be like the water you are used to, even with filtration systems insuring the water is potable. We do our best to provide all relevant information (such as trash pick up, locks, etc) within the check in packets. We apologize for the confusion and are glad that you enjoyed the rest of your stay. This home was IDEAL for our large 5 household family. The location and private pool seemed as though we were on an island all to ourselves. Just minutes from the bridge to Kitty Hawk provided us acces to the beach without worries of being ensconced in a mob of fellow vacationers. Absolutely perfect. The rental agency went above and beyond to correct the satellite issue and shortage of towels when we first arrived. The squadrons of dragonflies made the experience all the more magical. The owners are changing the number of occupancy, and a family of our size would no longer qualify to stay here. Pity. It more than accommodated our group but now we are forced to find a new location. The weeds around the dock removed the possibility of fishing. We also had to do without the seadoo we had hauled all the way there as the seaweed absolutely choked the engine. Probably better luck for those with a boat. The ramp is literally feet away from the property. The combinations to get to grill and other items in the listing was never provided and we had to improvise for those items. Our family had a really nice time at Southern Comfort. The house was a great size with plenty of room for everyone to find a spot for a nap, read a book or be outside.